'Take Back the Night' Highlights the Importance of Believing Survivors | BANG. Chills were not just the result of the weather on Wednesday evening in O’Neill Plaza. Boston College Care Week’s "Take Back The Night" took place as the sun was setting behind Gasson Hall. The event was powerful and emotional, sparking tears, hugs, and other displays of emotion from those attending. “The night" has come to mean fear. "Take Back The Night" stands to create a safe community for survivors and friends to take back that feeling of being scared and unsafe. The Women’s Center gathered students and faculty in a community of solidarity to support sexual assault survivors. The crowd was encouraged to join together to reflect, heal, and advocate. Dr. Andrés Castro Samayoa, a professor in the Lynch School of Education and Human Development, gave an impassioned faculty address on the importance of listening and compassion when presented with women who have been systemically silenced. “Loud and brave as they are, they continue to be unheard,” said Dr. Castro Samayoa. He said that showing up is the first step in making a commitment to stand together. Evenings like this are a reminder of how many people there are to not only speak and listen, but believe in each other. This is not a fight that has to be fought alone. Three brave survivors shared their stories and allowed the audience into a sacred space by speaking on an issue that is not often publicly discussed. They gave raw, heart-wrenching, yet powerful speeches that elicited anger and tears, leaving the crowd in awe of their resilience. The first speaker expressed fear in sharing her story, but explained that the stigma attached to survivors is exactly why she felt the need to speak up. She compared her experience to a boxing match. She took a lot of punches, but is now throwing some back. “Survivorship looks different for everyone,” she said. One speaker wrote a powerful poem on her experience, evoking emotion through metaphors and detailed description of her trauma. The speeches were set apart with appearances by The Sharps and B.E.A.T.S, who gave emotion-filled performances of "Rise Up," "Lift Every Voice," and "Sing" respectively. Even some of the performers got choked up. During the chorus of "Rise Up," two students in front leaned over to hug each other. The Women’s Center reminded the audience of the importance of believing, acknowledging that coming out at 6 p.m. on a cold night was a step in the right direction and that this event could have a ripple effect. “When we are willing to stand up for each other, we become more human,” a Women’s Center leader said. The event concluded with recognition that all feelings are all valid, followed by moment of silence to reflect. The silence was filled by sounds of sniffling, but was deeply empowering. 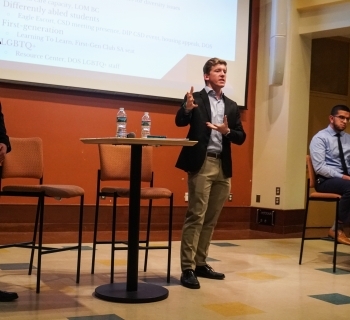 The incoming UGBC President and Vice President Michael Osaghae, MCAS ’20, and Tiffany Brooks, MCAS ’21, as well as Taraun Frontis, CSOM ‘19, Vice President of Diversity Inclusion, asked that we channel feelings into positive actions. They held a demonstration of shared solidarity where the audience was asked to close their eyes and light their candles when a statement that rang true to their feelings was said. The constant light of the candles was reassuring, and those in the audience expressed a true desire to help and support. The fight to end sexual assault is a great challenge, and it requires all the support people are willing to give. 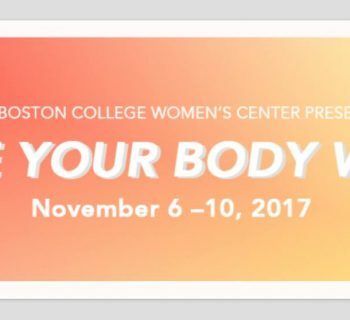 Some resources available on campus include SANet, a 24-hour confidential hotline available to the BC community, University Counseling Services, and the Boston College Police Department. For additional services and information, students can visit the Women’s Center.